One dish that we never get tired of eating at home is dosas, be it the plain ones using the regular idli/ dosa batter or the others using different dals/ lentils and vegetables or instant dosas using different flours. For today's dosa I have used rice along with three different lentils and used some chopped onions and grated carrots for the topping. 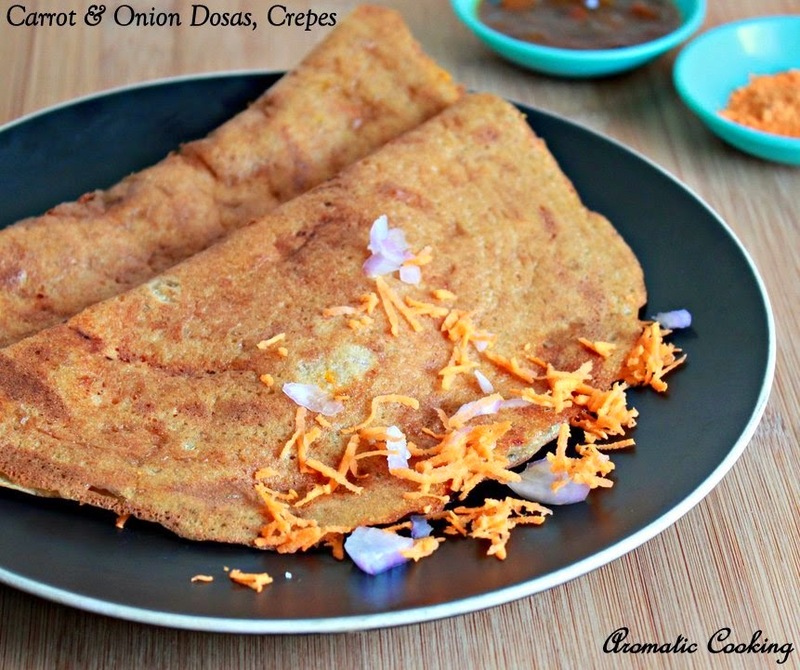 The dosas came out very crispy and tasted very delicious with the onions and carrots. The batter doesn't need fermentation, and since it has rice, lentils and veggies, it makes a complete meal..
Soak the rice and dals together for about 2 hours. Grind it with the red chillies, fennel seeds and cloves, into a smooth batter ( slightly grainy, not like a paste ). Mix in the salt and if needed some water, to make a thin, spreadable pancake batter. Heat a dosa stone or skillet, spread some batter as thinly as possible, spread the carrots and onions, press it slightly into the batter, drizzle some oil, cover with a lid and cook. Remove the lid, check if the bottom has browned and the dosa comes off the skillet, if it's done, fold it into half, as shown in the picture, remove and serve it with the chutney of your choice. While spreading the batter, reduce the heat and do it, so that you can spread it thinly. The dosas will become a little softer as they get cold, so serve them hot. It goes well with almost any chutney and also with idli milagai podi ( chutney powder ) too. You can use regular parboiled rice or raw rice instead of the idli rice. What is idli rice? Half cooked? And dal? Are all the dals shelled? Or I can just use peas? 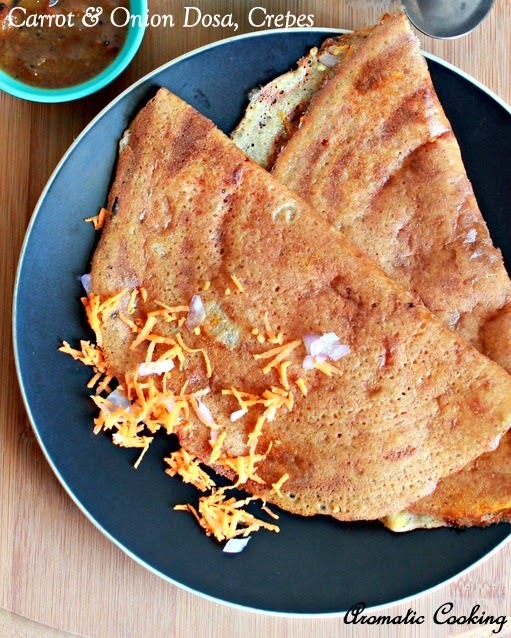 Such a healthy and delicious dosa, looks very yummy..
Wow.. Looks so beautiful and tempting! !